Applications Engineer Oliver Washington presents 'What's New Inspection and MBD Part 1' in this weeks Webcast Wednesday. 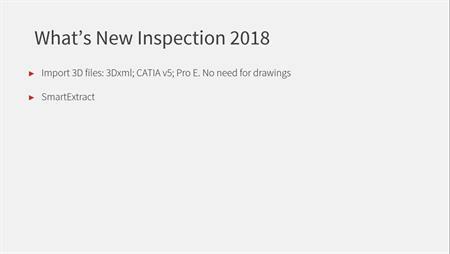 In 2018, SOLIDWORKS have been bounding forward with their Inspection software. Now, Ballooned Drawings and First Article Inspection Reports can be create directly from the 3D file, saving hours per project creating those complex, often misinterpreted technical drawings. Along with the 3D Inspection functionality, this webcast explores the MBD functionality within SOLIDWORKS and demonstrates the new features of the add-in. MDB allows the addition of annotations in the 3D file, including dimensions, notes and geometric tolerances. We explore the extended functionality within the universally accepted 3D PDF file format which avoids the misinterpretation that is often accompanied with drawings. Following this, we create Inspection documentation in 3D, which in my opinion is a game changer for the inspection industry. From the part file we go on to create industry standard format 3D Ballooned Drawings and your First Article Inspection Reports.